Best stock weight for large booklets and open end catalogs sizes like 9 x 12 and 10 x 13 is 70# to 80# text with a caliper of .005 to .0085. Follow the grain direction requirements as shown on the layout templates. Grain wrong setup charges will apply. An over run for setup and waste is required. The minimum for A-styles & #10 is 300 or 10% whichever is greater of the finished count. The minimum for large Booklets and Open End Catalogs is 400 or 10%. High Die Cutting requires a specific sheet size and position of the template on the sheet for best cutting register. Check the high die sheet size guide for the size you need. Check the layout templates online for the correct position on the press sheet. ECS will trim your over sized press sheets if needed. An additional amount of $70.00 per hour for trim cutting will be charged. Call us for help with multiple up templates, custom sizes and square envelopes. Mark the grip and guide position on your press sheet. Full outside or inside ink coverage REQUIRES NO INK OR VARNISH IN GLUE AND GUM AREAS. Adhesion is NOT GUARANTEED if ink or varnish is printed in these areas. The characteristics of certain stocks and/or inks may result in scuffing or cracking. Provide a blue line proof, rule-up or previous sample with your order and instructions. Allow 3 to 5 days production time for most orders. 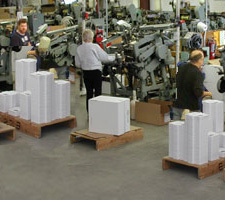 Quantities over 50,000, or large size booklets and catalogs may take longer. Please email, fax, or call ahead of time to let us know your scheduling needs. High Die Cutting requires that the sheet size and position on the sheet follow the layout template exactly. Best stock weights are 60# to 80# Text with caliper between .045 and .0068 for Standard sizes and .005 to .0085 for Open End Catalog and Large Open Side Booklet sizes. Grain direction must follow the instructions on the layout template. A grain wrong set-up charge of $70.00 for Standard sizes will apply. For Open End Catalog and Large Open Side Booklet, it's $100.00. An over run for setup and waste is required. The minimum for Standard sizes is 300 or 10%, whichever is greater of the finished count. Allow 500 or 10% for Open End Catalog and Large Open Side Booklet sizes.